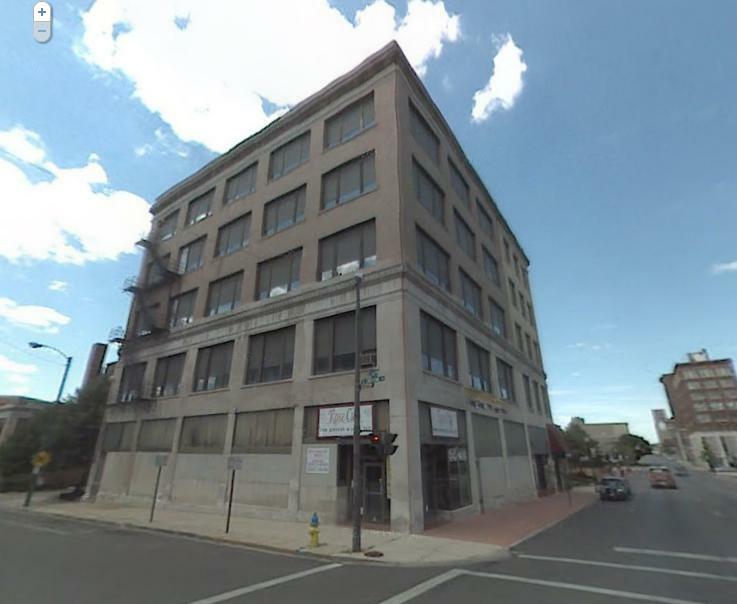 "Renovated Bushnell Building may be tipping point for downtown", Kelly Mori, Springfield News-Sun, December 13, 2010. Edward Wren settled in Springfield, Ohio, in 1877. He set up a dry goods business in 1877 with his Kinnane in-laws. Kinnane and Wren (or "Kinnane, Wren and Company") opened their dry goods store on 4 Apr 1877 in the Commercial Building (built 1875) [Edward Wren obituary]. This was on S Limestone St, near the junction with E Main St.
Looks like no old buildings on that stretch today (see street view). Note that the old building on the far side of the junction is the Shawnee Hotel (built 1916). The Kinnane - Wren partnership dissolved in 1892 [Edward Wren obituary]. Wren set up as the "Edward Wren Company". 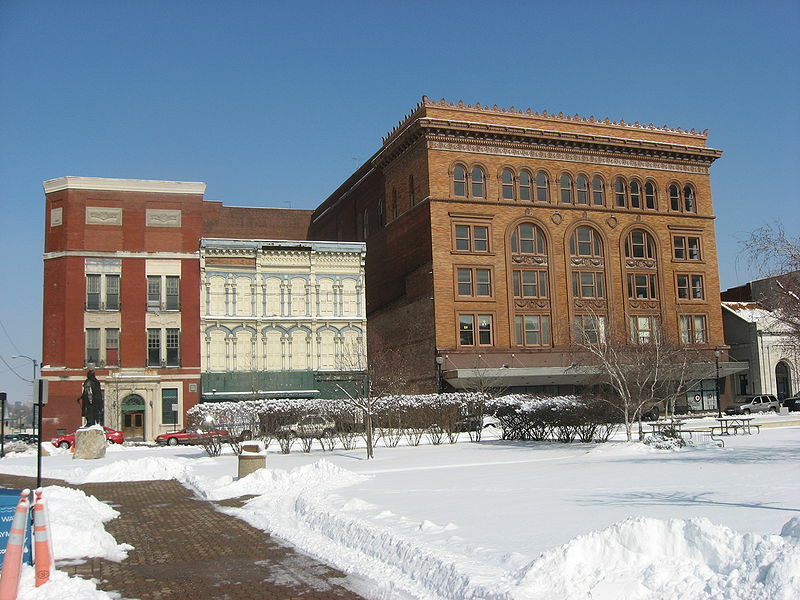 Kinnane's went to the Bushnell Building (built 1893, see below). Wren's stayed in the Commercial Building until moved to the Johnson Building in 1903. 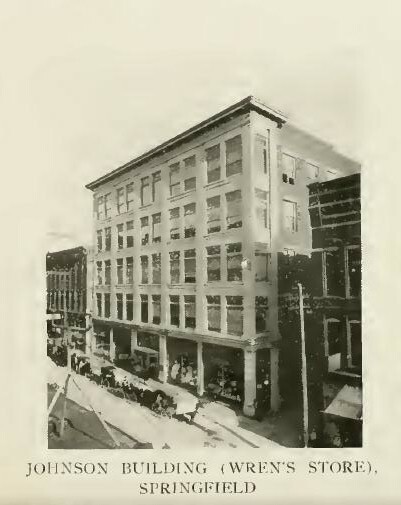 Wren's Department Store moved 1903 to a new building, the Johnson Building (designed by Robert Johnson, built 1902). This is at 21-29 East High Street, Springfield, Ohio. This was Springfield's first steel skeleton building. This was Springfield's first department store. Wren's Department Store was sold by the family 1920. It remained open, and kept the name "Wren's". Still called Wren's, East High St, as at 1926. Wren's Department Store, East High Street, Springfield, Ohio. The building has been altered since. The old Wren's Department Store, East High Street, Springfield, Ohio. [Rockel, 1908] shows Wren's was then at the Johnson building, and the "Bushnell Building" was occupied by his former partners, Kinnane's dry goods store, and other businesses. In 1939 Wren's itself moved to the "Bushnell Building" (designed by Shepley, Rutan and Coolidge, built 1893) [Mori, 2010]. This is at 14 E Main St, Springfield, Ohio. Wren's remained locally owned until 1952, when it became part of the Allied Stores chain. The Springfield store remained called Wren's. In 1984 Wren's merged with William H. Block Co. (which had become part of the Allied Stores chain in 1962) and the Springfield store name changed to Block's [Mori, 2010]. In 1987 the Springfield store finally closed. There was a "Wren's Restaurant" at the building. The Bushnell Banquet Center (or via here) is now in the Bushnell Building. It has an "Edward Wren Room". Wren's Department Store building (RHS building), E Main Street, Springfield, Ohio. Photo 2010. From here. See full size. The old Wren's Department Store, E Main St, Springfield, Ohio.